I've been lusting after a Clarisonic for absolutely ages, but paying over £100 for something I'm not entirely sure I'll get along with just doesn't sit well with me. Whilst Clarisonic cleansing brushes have received rave reviews, some of us just don't have the cash to make that kind of investment. However, the skincare gods have answered our savvy-shopping prayers by releasing a considerably cheaper cleansing brush. 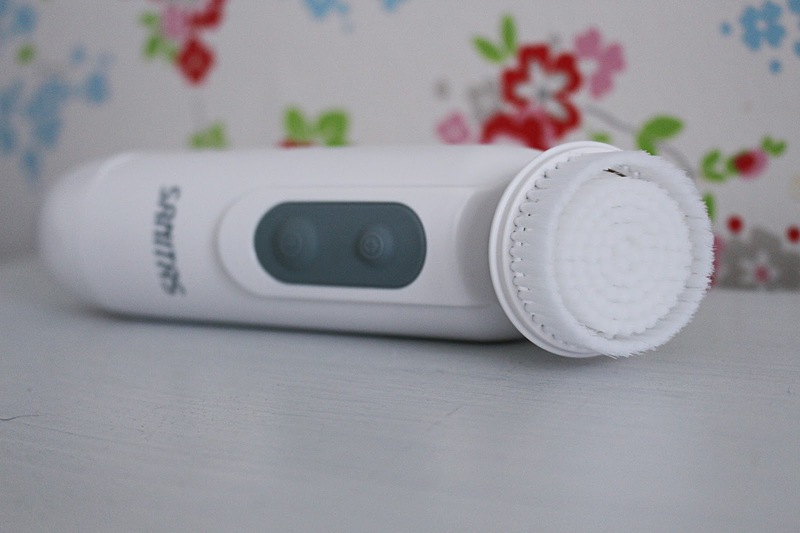 One that fits the bill in terms of Clarisonic's proportions, but comes at a teeny fraction of the price. 'How much?' I hear you ask... Just £9.99. Pretty unbelievable, right? That's right - Lidl, everyone's favourite discount grocery store, has jumped on the cleansing brush bandwagon and has well and truly come up with the goods, releasing the Sanitas Cleansing Brush, at a ridiculously affordable price. I've been lucky enough to receive a brush to try and I just have to fill you guys in on what I think to it. First of all, I will just say now that I've never had the pleasure of trying any of the 'big gun' cleansing brushes out there, so this is my first experience with one. I will be keen to see how other bloggers who have previously tried the likes of the Clarisonic think this fairs, however. Okay, so if you're new to cleansing brushes - they're pretty simple. The general idea is that you use them along with your favourite gel/foam cleanser to give a much deeper, more effective clean. 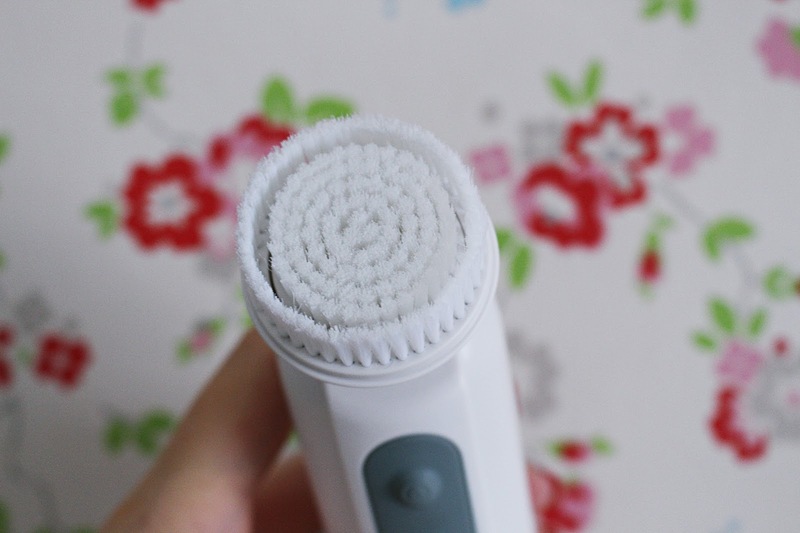 The brush works by rotating at a variety of different speeds to buff away at the skin and get rid of makeup, dead skin cells, dirt and grime, leaving your skin feeling smooth and soft. It's said to remove considerably more makeup, dirt etc. than traditional cleansers, which is what has made cleansing brushes such a popular choice over recent years. So, what do I think to Lidl's cleansing brush offering? Honestly, I love it. I've only been using it for a couple of weeks but for the price I think this is a complete must-have if you're all about skincare on a budget. I'll be the first to admit, I can be pretty lazy when it comes to my skincare, but having this bad boy on hand has made things so much quicker and easier. I simply rinse my face, whack a bit of cleanser onto the brush, push the button and move the brush in circular motions over my skin. It usually creates a bit of a lather (depending on the cleanser you're using), and after a minute or two your makeup and muck is buffed away. Then all that's needed to do is rinse it off and voila - perfectly cleansed skin. It can take a bit of getting used to, having this machine vigorously cleansing your face, but it is totally worth it and after a couple of days you become accustomed to it. Since using it my skin is so much softer and smoother, blackheads are reduced and I feel like for once my skin is getting a proper clean. Usually when I wash my makeup off and go to apply my toner tonnes of my makeup is still on my skin - but not anymore. Very little, if anything at all, remains on my face once using this and that definitely gets me excited. There is nothing better than the feeling of properly cleaned skin. I have noticed a few spots pop up since using this brush but I think this is what is known as the 'purging' stage - where your skin kicks out all the bad stuff due to having such a good clean, making way for gorgeous skin. It's literally just a few little pimples though and not cystic acne - the overall appearance of my skin's texture etc. has improved a lot so the pimples don't bother me much! 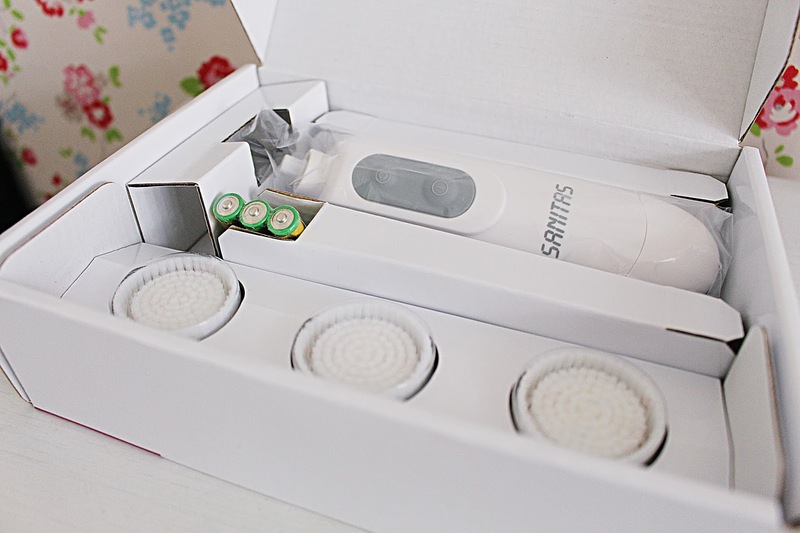 Overall I am a huge fan of the Sanitas Cleansing Brush and would completely recommend it to anyone who feels like they're not giving their skin a good enough cleanse. For £9.99 it comes with three replacement brush heads, as well as the batteries needed to keep it going (unlike the Clarisonic it isn't mains powered/charged but relies on disposable batteries). It might not be pink but it sure is good at what it does, and I would 100% recommend it. The Sanitas Cleansing Brush is available from Lidl and is released TODAY, so get your hands on it asap. I predict this product will sell out straight away, so go hunt it down whilst you can!